When they looked at all workers, they found that earnings, adjusted for inflation, rise by 38 percent over a typical person’s lifetime. But these lifetime patterns vary dramatically by a worker’s income bracket. The magnitude of increases is much greater for the highest-paid workers than economists had thought. Inflation-adjusted earnings more than triple over a lifetime for those who make it into the top 5 percent of all earners. But they don’t rise at all over the lifetime of a low-income worker with earnings at the bottom 20 percent. Another pattern that differs by income bracket is the sudden change in income that can occur during someone’s lifetime. Negative earnings shocks for workers at the lowest earnings levels tend to be transitory, with the vast majority returning to their previous levels within 10 years – increases, on the other hand, are quite persistent. Surprisingly, the reverse is true for workers with earnings at or near the top – declines, if they occur, are very persistent and increases are transitory. Improving our understanding of earnings changes is important, the researchers conclude, because they are “a strong determinant” of how much workers can borrow or save. Yet another reason to work until you’re 70. You’ll get used to a lower income. This may be especially important to people with pensions benefits that are based on their highest pay over the last 3-5 years of employment. A job reclassification at that stage with a related decrease in earnings could significantly reduce their expected pension payment. Multiply this by the fact that those born after 1957 or so have had increasingly lower earnings, adjusted for the business cycle, during EACH PHASE of their lives. 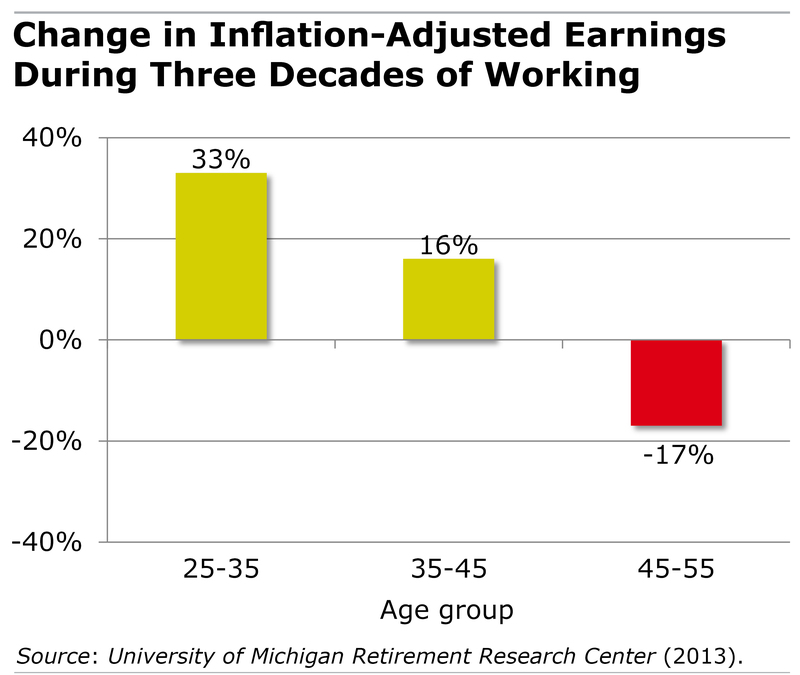 And the were less likely to get employer-funded retirement benefits. Until now, the first worse off generations have been during the period of their lives when their incomes were rising even though, in a lifetime sense, the were falling. But now they are going to find out how poor they are. In addition to the effect on people as individuals, think of what this will mean to consumer demand in the U.S. — and global — economy. An economy that has been dependent on Americans spending more than they earn for sales. Americans going into debt in addition to not having retirement savings. So how are they going to spend now? Take more from younger generations, who are even WORSE off? I’ve run across that phrase on multiple occasions. Am I correct in taking it to refer to people who collectively bargained for pensions? May I suggest, that we do not embark on an inequity debate here. There is a very simple rule by which companies decide whom to hire, how much to pay them, and if they want to offer raises to keep people from leaving. Maybe it is the constant ability to acquire new skills that causes these early rises in income? And maybe, just maybe, if older employees continued on that path (of constantly adding qualifications to their resume, so to speak), they would always easily out-compete all the others. It seems to me that most CEOs, CFOs, CIOs, etc. don’t come from the 25 to 35 age bracket but often from far beyond age 50. How come?